A local kite business had organized Kites, Bikes and Picnics and had advertised the event via the usual social media channels. Where there are kites flying, the MBK camera follows! 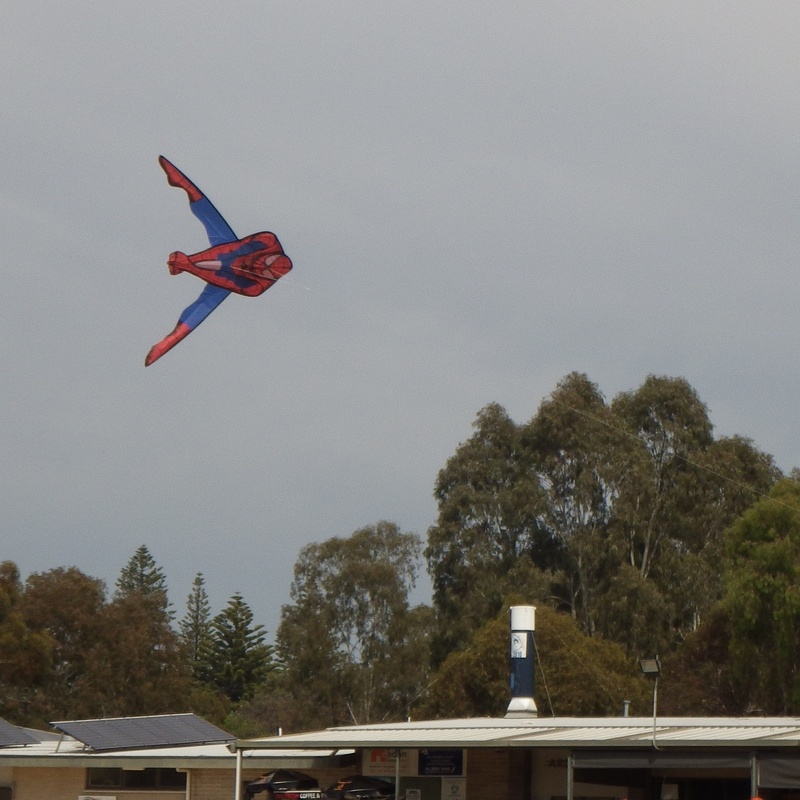 And often a fair turnout of local kite club members too. Just a couple of 2-Skewer designs sitting on the back seat, ready for a quick fly with no setup/rigging necessary. Just a couple of kite club members were present initially, but it looked like they (or the organizers!) might have done a good job advising the kids that you just need to stand still most of the time. 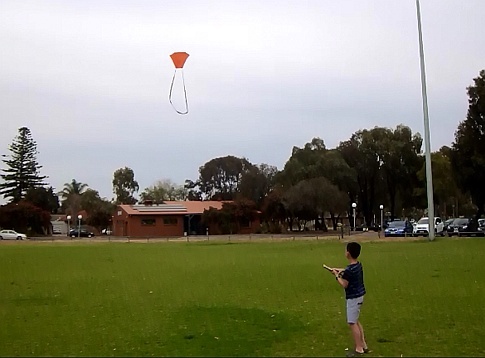 Let the kite fly itself, unless there really is 'not enough wind'. Every photo on this page may be clicked (or tapped, as the case may be), which loads a much larger version of the same photo. One little fellow was having trouble with one of those popular paper-and-straw (as in drinking-straw) home-made designs. As far as I could tell, his father correctly diagnosed the problem as 'not enough tail'. 6 to 10 times the length of a fairly small kite is sometimes the tail length necessary! 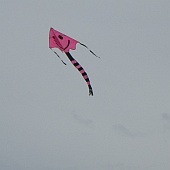 There are exceptions to small kites needing lots of tail. Notably, those exquisitely designed and engineered 'miniatures'. 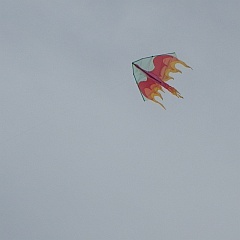 With sufficient accuracy and a suitable design, kites smaller than your hand can fly without any tail at all. 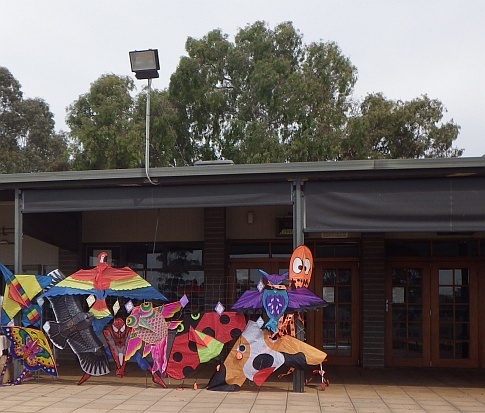 With the breeze dropping out from time to time, helpers were kept busy re-launching kites into the next gust that came along. Of course, sometimes it was the opposite problem, with a kid over-speeding a kite whilst running into the breeze! 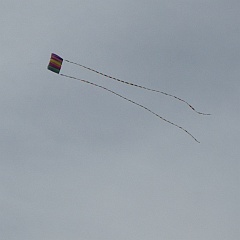 One side bends a little more than the other and round the kite goes - smack into the grass. The sort of treatment fiberglass and rip-stop nylon designs can put up with time and again. They might not fly nearly as well as tissue and bamboo, but they certainly are tougher. 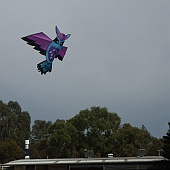 Eagle kites were popular at Kites, Bikes and Picnics. At one stage there were a couple of these birds in the air at once, almost side by side. One of these became tangled in its own line as it blew over a few times on the ground. A small voice behind said 'thank-you!' as I unwound the fiberglass and nylon bird and set it free to soar once more. Another would-be kite flier of very tender age was spotted trotting off downwind. 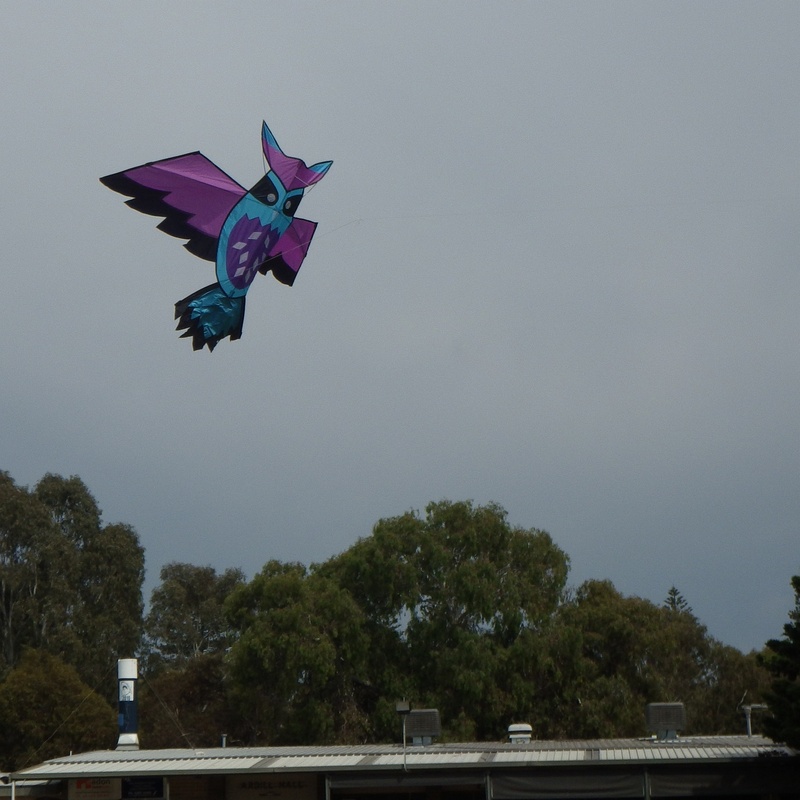 Naturally, the kite started drifting to the ground with so little 'wind beneath its wings'. A few words to both him and his helper set things straight and soon the kite was up where it belonged. After getting plenty of camera-work out of the way, it was time to fly. Actually, it was Aren who ended up doing most of the string-holding. He had become enthused by seeing other kids having a great time keeping their novelty kites in the air. We walked back to the car and grabbed the 58cm (2ft) span 2-Skewer Barn Door, which features a simple ribbon tail looped from one side of the trailing edge to the other. Up it went, the plastic and bamboo-skewer construction ideal for the light and variable conditions. We also had the 2-Skewer Delta in the car. But deltas are so common now, why not go for something other people might find more interesting! The bright orange Barn Door flew well most of the time, listing to the left a bit during some of the stronger wind gusts. 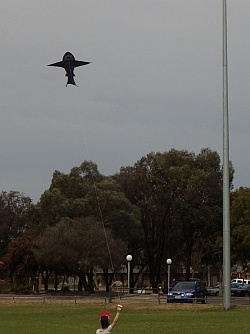 Aren did well to coax the kite back into the air when the breeze strength went the other way and dropped out. 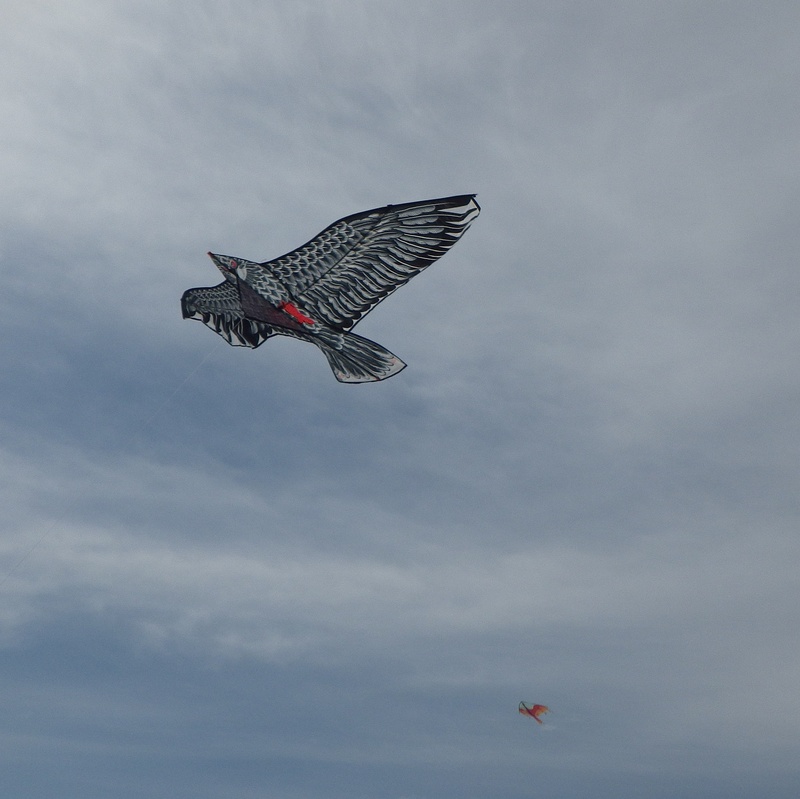 On around 150 feet of 20-pound Dacron line, the kite was holding about 100 feet over the field. Eventually the Barn Door came down nose-first into a wet cordoned-off patch of grass. With a spar poking through an old piece of tape and needing repair we then called it a day. 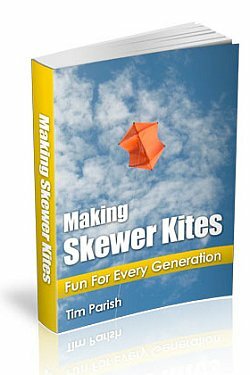 Check out our Making Skewer Kites e-book, if you have any sort of DIY kite-making urges. These are very low-cost but high-performing designs. Easily repaired too, so you can keep them flying for many months or even years - like ours! A very good venue, here in Adelaide, South Australia, for an event like Kites, Bikes and Picnics. The field size was ample, extending well past the usual confines of a traditional oval-shaped 'oval'. Most of the perimeter was free of large trees and obstacles. In fact, on the day, the wind direction put the larger buildings and tallest foliage directly downwind. Thus, launching kites was easy in the relatively smooth and uninterrupted breeze.